Until 1890 and the creation of Sacred Heart of Jesus Cemetery, most of the deceased of Sacred Heart Parish were buried in St. Alphonsus Cemetery. The first interment in Sacred Heart of Jesus occurred in April 1890. 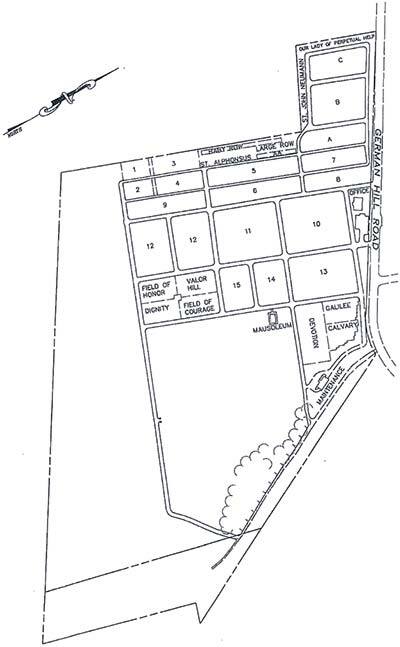 The first provision for a parish cemetery was made in 1889 by Father Henry Urban, C.Ss.R., when he purchased, in the name of the Redemptorists, 21 acres of farmland on the German Hill Road (sometimes called Mount Carmel Road), about three miles from the church. The following year he added 31 acres to this tract. Finally, in anticipation of a proposed access way, a further parcel of 21.5 acres was added. Though the access route was never built, the cemetery remains a quiet, pastoral refuge for the deceased. 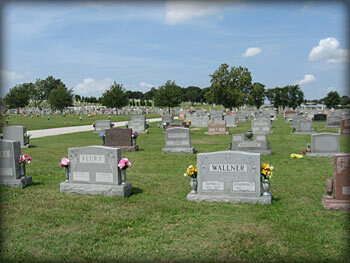 As no general blessing was given to this cemetery, it is open to both Catholics and non-Catholics alike. Still, at least from 1891 onward through the next several decades, the chapel served as the setting for an All Souls’ Day Mass. Precious to the memory of the Redemptorists is the grave of the first confrere to be buried in Sacred Heart of Jesus. The Rev. Thaddeus Anwander, C.Ss.R., was a zealous missionary throughout the City of Baltimore, and showed an abiding pastoral concern for the Oblate Sisters of Providence, a community of Black Catholic women religious who continue to minister in Baltimore. There is a great deal of opportunity for expansion of this cemetery for in-ground internments as well as mausoleum and cremation space. Please contact our Family Service Associates for details. A one page map of Sacred Heart of Jesus.